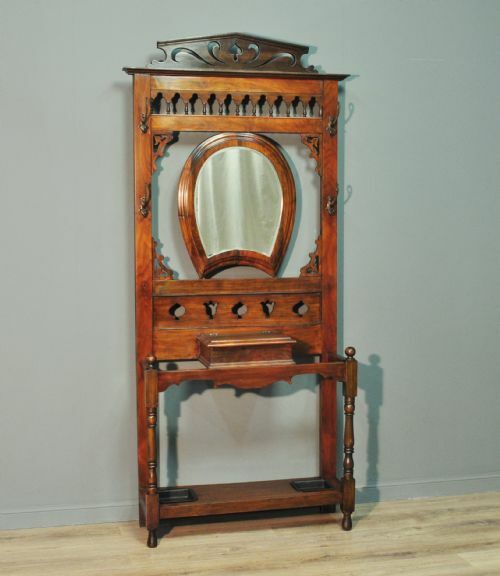 Attractive antique Victorian mahogany mirror back hallstand. A lovely Victorian mahogany hallstand. We date this hallstand to the late 19th century. The back features six double coat hooks and two single hooks with a central mirror. The mirror glass is thick and bevelled and is showing only minor signs of foxing and some light scratching. The stand is fitted with a central shelf below the mirror. There is a lidded box below the shelf which is flanked by two open stick/umbrella areas over base drip trays. 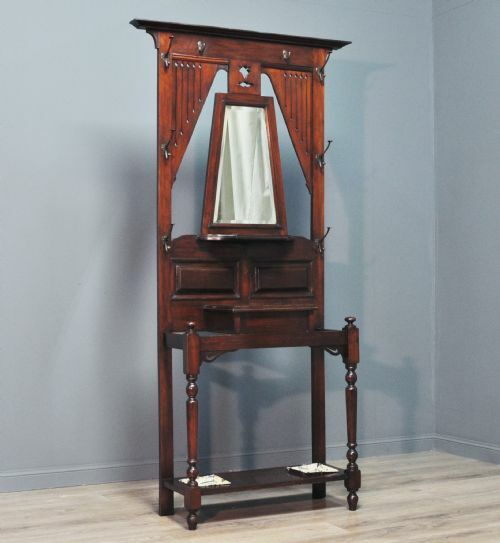 The hall coat stand has a height of 80" (203cm), a width of 40.5" (103cm) and a depth of 12.5" (32cm). This lovely Victorian mahogany hallstand remains in a good solid condition with only very minor surface markings commensurate with age and usage. There are a few minor indentations from past use and the drip trays are showing a bit of wear. There is a bit of wear to the top of the lidded box and there is a small chip to the outer rear of the back right hand leg. The double hooks have been replaced with period ones at some point in the past. This remains a very stylish and elegant Victorian mahogany hall stand which will continue to provide good service for many years to come.